I met Krista Varsbergs several years ago when we were both volunteers in a school art program. When I visited her home several months later, it took me a few minutes to realize most of the beautiful artwork displayed – paintings, photographs, mixed media – was her own. Since that time, she has become a friend, a client, and a colleague. Like many of us who make, she is always exploring new directions and combining interests in her art. Case in point, pairing favorite quotes with her photographs to create an image that makes you stop, think, and reflect – and, with the photo below, pull your sweater a bit closer before moving on to the rest of the day. YM: I am always interested in how people come up with a name for a business … How did you arrive at the name “Brake Studios”? Krista: My last name happens to be pretty hard to remember and spell right, so that wasn’t an option for my business. I wanted the name to represent why I’m making and selling this work, not just describe what it is. And so I boiled it down to this: I hope these prints will cause people to pause, if even for a nano-second, in the middle of their craziness. Put on the brakes so to speak. 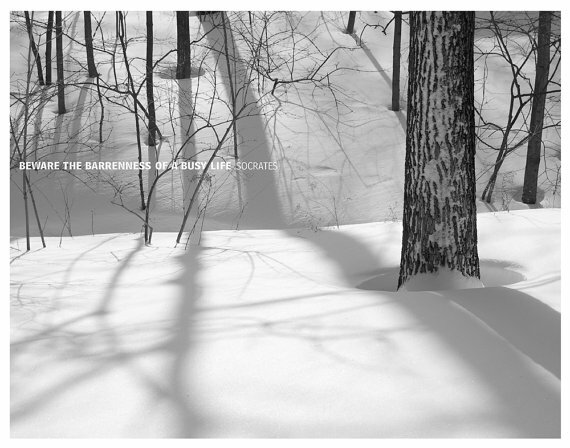 YM: Your photographs and quote pairings are so powerful. Where do you begin – with the photo or the quote? Krista: I’ve been collecting my favorite quotes since I was a teenager. I was organized back then, writing them carefully in a beautiful handmade book a friend gave me, but now they’re just stuffed in a hanging file – a big mess of notes scrawled on scraps of paper. But it works! I usually dig around in there and start with a quote that’s particularly meaningful to me at the time, and then I try to figure out how to make it visually appealing without illustrating it too literally. I don’t want it to be too obvious, like a picture of a window for the “when a door closes, a window opens” quote kind of thing. I also have a digital equivalent of the hanging file for photos I have taken. I go on a hunt for something that just resonates with the quote, and sometimes the image ends up being primary, the quote secondary. That’s when I think the image can stand alone, but if you get up close enough you get the bonus of reading a really great quote. YM: Your prints are now on Etsy. What else is happening in the studio? Krista: Selling my prints is partially to support my painting habit, and some archival prints of that work – still lifes and landscapes – will be coming to my Etsy shop soon, so I am busy selecting the paintings that will be featured. 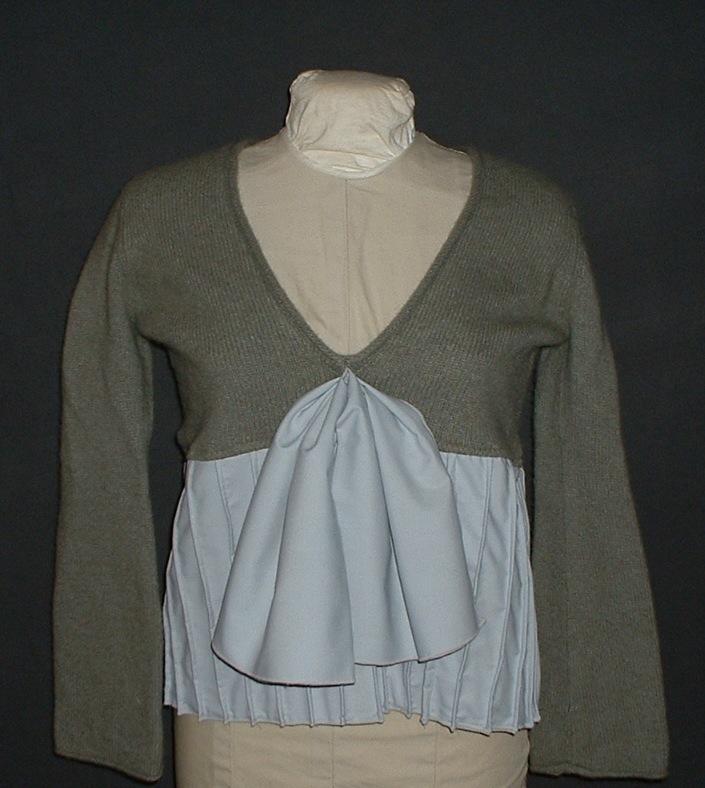 Visit Brake Studios here to see more of Krista’s work; she also takes custom orders. Last year my daughter came home from school with the news that there was a new girl in the 4th grade who was really nice and her mom sewed. Since that time, our daughters have become good friends and I’ve had the occasion to talk “shop” among other things with the mom, Marybeth Lewanski. 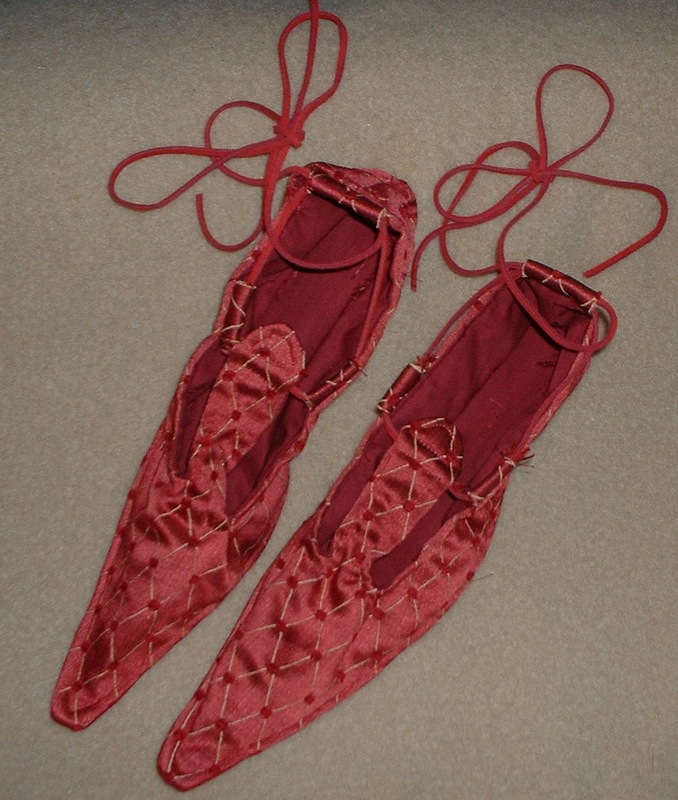 A few months ago, she mentioned her Etsy shop, Emmevielle, and I was smitten by the fairy shoes. I asked if she would talk here about her craft, so read on but be warned: You may just want to clear the calendar for a few hours to sew afterwards! Yvonne: How long have you been sewing and why did you begin? What was your first project? Marybeth Lewanski: I began sewing way back in elementary school, probably during 4th grade. Though my memory is hazy, I know I would have been taught by my mother. It’s interesting that among the five girls in the family, I was the only one who ever learned to sew … go figure! I am not sure what my first project was, but I do remember making a lot of curtains for my mother. YM: What do you most like to sew? ML: I enjoy creating bohemian clothing from tops to skirts to dresses. It is fun to think of clothing as a canvas on which to express a thought. Only recently, I’ve begun to use clothing to convey a message reflecting a thought or a feeling from some of the greatest thinkers. Topics include life, self-expression, and inspiration. YM: What are you sewing right now? ML: I sew at the same pace I do everything else; more rapidly than conventional. I have so many pieces of things; fragments of ideas in a variety of fabrics. Some times, ideas for a piece come to me quickly. Other times, I keep elements around until it occurs to me what they are supposed to be. Once I know what something is designed to be, then I do all of the preparation for sewing: measuring, cutting, pinning. Sewing is a relatively quick final step. I usually know what I will be working on the next day. Most of my projects are completed in a few days. 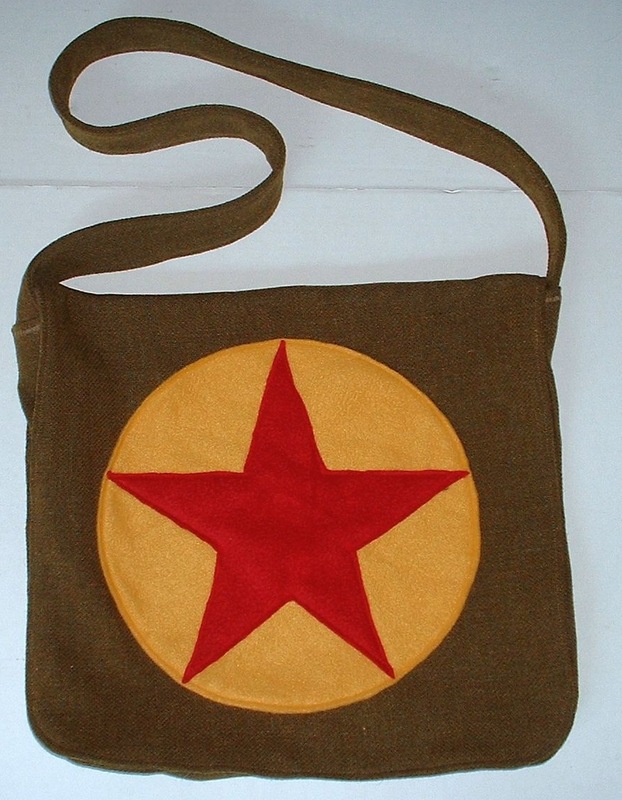 Right now, I am concentrating on clothing with an occasional bag here and there. 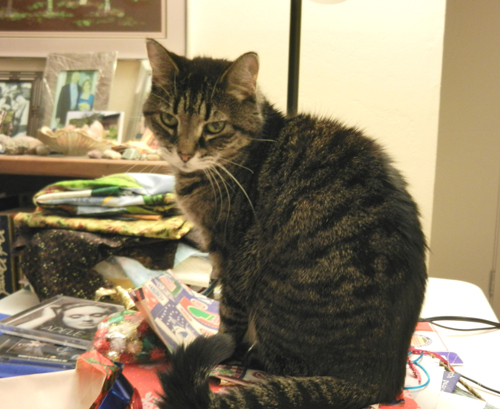 YM: What is your sewing space like? ML: I have two spaces that I work from. I have a studio in the basement that has excellent lighting and tons of room for supplies; however, it’s in the basement. 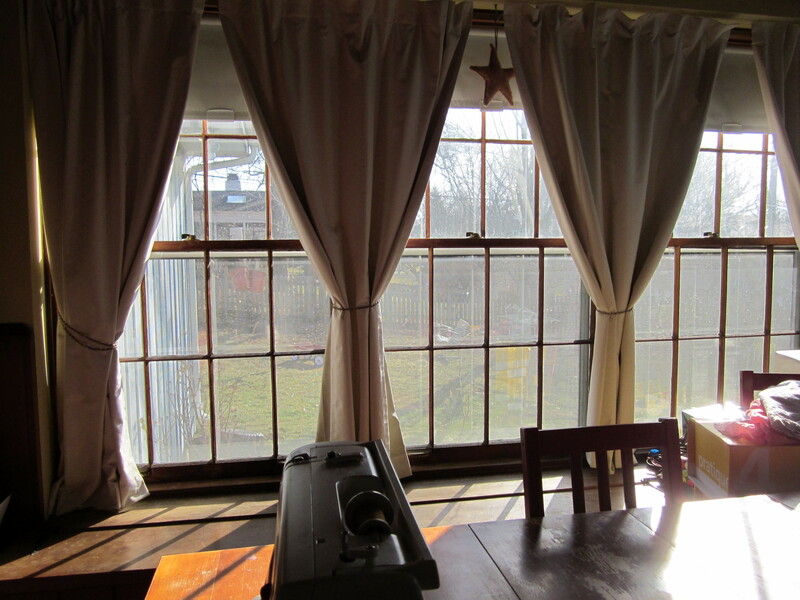 I always end up back at the kitchen table where the large windows provide so much sunshine to work by. My husband really wishes that I could stay put in the basement studio, but he knows where I will always be. YM: What is your favorite part of a new sewing project? ML: My absolute favorite part of sewing is when an idea for a fabric occurs to me and totally clicks. There is nothing more exciting than the spark I feel when a new idea comes together! YM: Do you tend to finish what you begin, or like many quilters, do you have some unfinished projects stowed away in the closet? ML: I always finish what I start. It’s not exactly a choice; I would describe it as more of an imperative. It comes from inside me and I see it in other parts of my life as well. YM: Do you design any of your own patterns? ML: I tend to follow patterns to the best of my ability. I envy those who can manipulate a pattern in line with their vision. One thing I would love to learn is the art of resizing a pattern; I’ve seen so many lovely vintage patterns, however, they usually come in just one size. YM: What makes for a beautifully sewn garment in your opinion? YM: Tell me about your Etsy store name, Emmevielle. ML: Well, my husband introduced me to the world of Etsy in 2008. I immediately wanted to establish a presence, so in my impulsive way, I chose the first name that came to mind. Why Emmevielle? I’m more than a little embarrassed to say that it is the spelling of my initials M-V-L. I thought it sounded French and to me it was so close to “femme vielle” which I think would be an old young woman — which is the way I see myself. 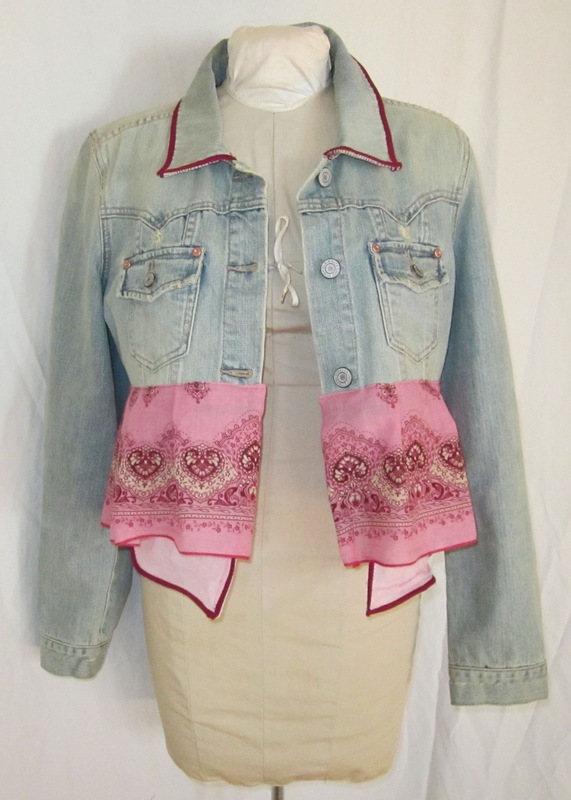 YM: Your Etsy shop seems to reflect what you like and what you like to make in that it is a mix of vintage finds, as well as clothing that you have upcycled. The whole idea of upcycling has take the country by storm in the last couple of years, but you started doing this long before it became hip. What attracted you to making something new from something old? ML: For years, I have loved to shop at thrift stores. It’s fun to find the unexpected, the prices are low, and the selection is always changing. In the past, I only shopped for fabric at the fabric store. But, as we all know, prices have been increasing over the years. It really was a ta-da moment, when I realized that I could combine both avocations – thrift shopping and sewing. I saw potential in the discarded items and realized that they needed to live again, perhaps in a slighly different way. It opens up a world of possibilities. It is interesting to think that two or more pieces with different histories could come together for something new and great. I really upcycle because it’s fun; I wouldn’t do it if the excitement was not there. YM: Project Runway has introduced a whole generation to sewing and made it very cool. Do you watch Project Runway? What do you like best about the show? ML: I have only seen Project Runway a few times. I have a lot of respect for the people who can design on the fly within time constraints. Whether they win or lose, I think many of the contestants demonstrate talent and skill. Also, I think that the show has made sewing ‘cool’. The show attracts young people to the industry in a way nothing has before. Over the course of the last year, several people have contacted me to tutor them in sewing – a direct result of the popularity of the show. YM: My house, nicely put, can seem a bit up for grabs sometimes with a quilting project laid out in my sewing room, a science project on the kitchen counter, an art project on the kitchen table, and books spilling off the hall entry table on a range of topics, but I believe that this atmosphere of making results in a lot of conversation between my kids and me, as well as builds good problem solving skills. What do you think your family has learned from your sewing? ML: Surprisingly, my making has given me a cool factor among the kids and their friends; something I’m still surprised to hear. Having a project in progress around the house is a bit of a dangerous proposition. I hate to put everything away, but with four kids, a dog, and a cat, I’ve learned it’s better to be safe than sorry. Otherwise, the cat snuggles into soft fabric, the dog chews on spools of thread, and the kids are really, really sorry for spilling something! I think that my making things has given the kids the idea that I know how to do anything. They come to me with problems that they think I can fix because they’ve seen me put things together. In addition, the kids have seen that it is possible to work from home. They know that I take my business seriously and that I push myself hard to meet deadlines. My oldest son marvels at the success I have had and he has said that he knows it is because I work hard. My business influenced him to start his own online candlemaking business last summer (he’s 14). My youngest asks me to teach her new skills all the time; last year, she was beading, this year she learned to sew by hand (she is 9). Truth be told, my husband would prefer that I have a conventional office job. Even so, he has seen my shop grow over the years. He knows I’m determined and that I will continue to work hard for what I want. YM: As mentioned in previous interviews here, I love the American Craft Magazine series, “Why I Make,” so why do you make? ML: I make because I have to – it’s something that’s deep inside me. Since I was little, I’ve always made things with my hands. Using my imagination and bringing a project to fruition seem to be part of my DNA. The times in my life where I tried to work a conventional 9 to 5 have been less than stellar. I need to work for myself making the things that need to be made. YM: What type of sewing machine do you sew on? ML: I sew on a relatively straightforward Janome machine with a handful of stitches and no computer capabilities. I also use a Simplicity Easylock serger which alternates between being my favorite tool when everything goes smoothly and the bane of my existence when I need to rethread it. YM: What are your favorite fabrics to work with? 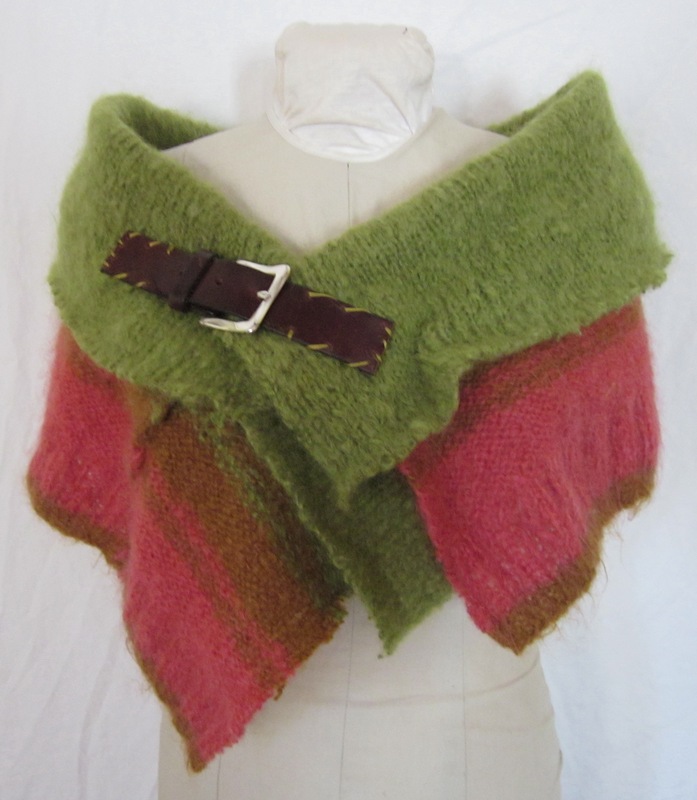 ML: Cotton duck, wool, lightweight leather are my favorite to work with. Their weight makes it easy for the machine to perform optimally. I would love to work more with velvet, but have found it very difficult to work with. YM: What are your favorite sewing tools? ML: My new favorite tool is a pair of scissors from the Dollar Store; they allow clean cuts on so many fabrics on which my more expensive scissors have let me down. Another tool that I like is my light box; I use it to copy multiple sizes from one purchased pattern. YM: Do you have a favorite sewing book or two that you can recommend here? ML: A must-have is The Dressmaker’s Technique Bible: A Complete Guide to Fashion Sewing by Lorna Knight. It is an excellent reference full of helpful explanations. Also, lately I have really admired the work I see in Belle Amoire magazine, as well as the Ruth Rae book, Layered, Tattered, and Stitched. YM: What is your favorite fabric store in the Chicagoland area? ML: Oh, I always end up at Jo-Ann Fabrics. It’s a convenient go-to for supplies and a reliable inventory of fabric. Online, I have often used Fabric.com for a great variety and reasonable prices. YM: What music do you like to listen to? ML: Am I the only one who is still stuck in the 80’s? I love to dance to music I know and 1980’s dance music brings me back to a really carefree time in my life. YM: Are there other crafts you enjoy? Any new areas you would like to explore? ML: About 10 years ago, I took a class in ceramic tile. I loved it and the possibilities are endless with clay. It would be wonderful to take another class and spend some time in a ceramic studio. To see more of Marybeth’s work, visit her Etsy shop here. Happy sewing! Yvonne: What is your studio space like? Joy Troyer: When I lived in Minnesota, I had a full basement in which I did batik. You need “dirty space” to work with melted wax and messy dyes. I had lots of space and it was kind of my art cave. I played my music and thought of my work as meditation. 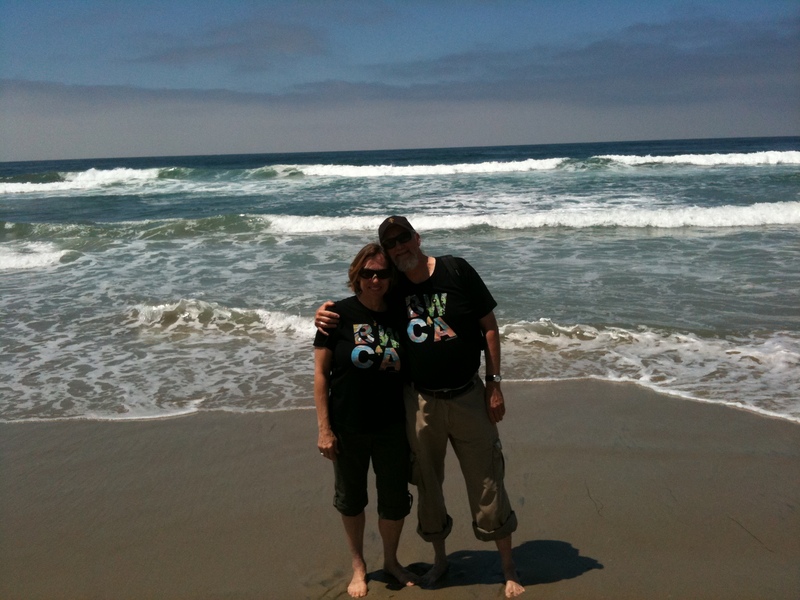 Then I moved to the San Francisco Bay Area. I moved from a three-bedroom house with a basement to a one-bedroom apartment with no basement. It was too difficult to find space to do the batik. 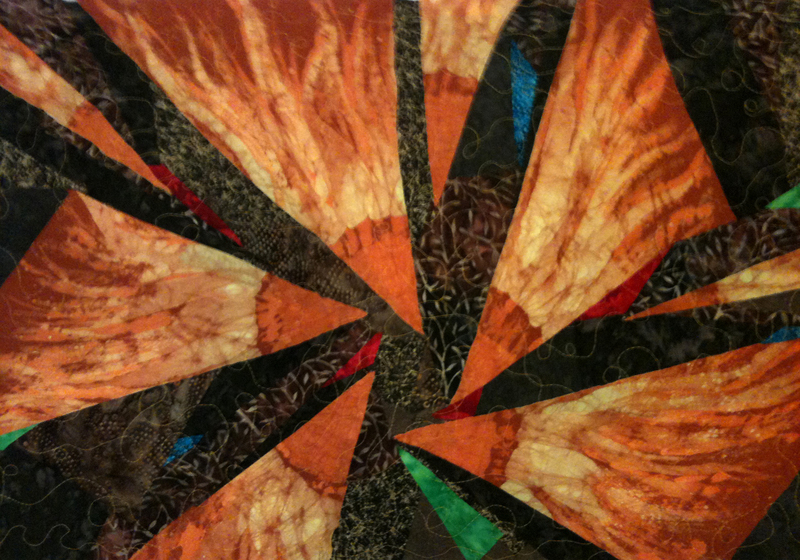 So, I started doing fabric collage and the occasional dye painting. I worked on the kitchen table and ate in the living room. Now I live with my husband in a two-bedroom apartment. He likes to have me around, so I work on a 6 foot table in the living room so we can talk or watch TV while I’m working. In the spare bedroom/den I have my bins of fabric and the computer. Since the sewing machine is usually out and a project in process, it means our living room is seldom “tidy,” but it works for us. YM: When you are creating, how do you prepare your space? Joy: When I start a project, I first pick out the fabrics I’m going to use, which can take up the whole den or living room floor. Then I put away all the pieces I’m not going to use and iron the ones I picked and try to start in a fairly neat space. Once I get started, though, I don’t like to have to put everything away, so it can be a little messy. One factor is that I have a cat. Kali likes to sit on my in-process pieces. If I leave cut pieces laid out, but not tacked down, they are spread all over the place when I get up the next morning. So, I usually gather the un-attached pieces and put them under a piece of cardboard. Kali comes and sits on the cardboard but doesn’t mess up the designs I’m working on. I should mention that I believe cats indicate they like something by sitting on it. So, I find it quite encouraging that she sits on my artwork! She obviously loves my work. YM: Do you work in your various creative mediums simultaneously or do you tend to concentrate on just one for several days, weeks at a time? Joy: When I was doing batik, I would work on several pieces at a time in order to save time and dye by dyeing several pieces at once. 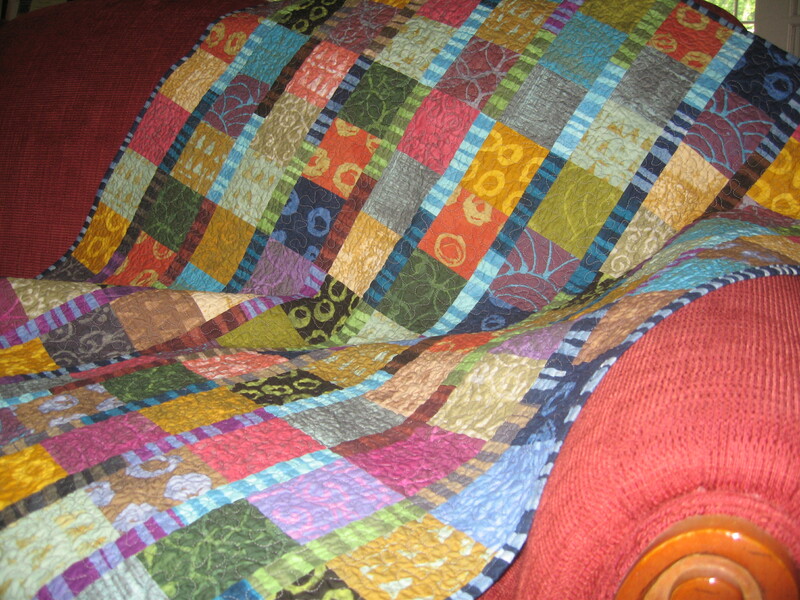 With fabric collage and quilting projects, I tend to do one project at a time. I really like to see things get finished. Once I start, I tend to forge forward until it is done. Then I take a break and perhaps do some writing, take a class, do some framing, or do a small project before taking on another big project. 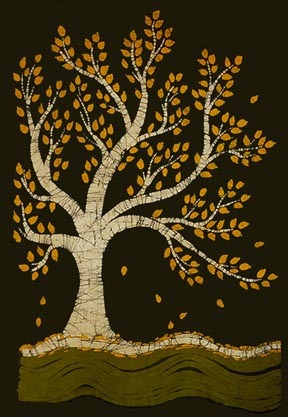 The biggest project I did was an 8 ft. x 3 ft. piece for a local church (see “Community” below). It took me several months to complete since I do my artwork in my spare time. This one was hard to work on in my space because I had no where to hang it. I had to go to my upstairs neighbor and have her hang it over the balcony to see if it was proportional and hanging right. YM: What is your favorite part of the making process? Joy: I really love the designing part. I’m not one to follow pattens and I like coming up with cool ideas and figuring out how to start. With batik, I make several sketches and then decide which dyes to use in which order and make a chart. (I was a math major in college and I just love puzzles and charts!) The painting with wax and the dyeing part was actually kind of mediative, but not my favorite parts. 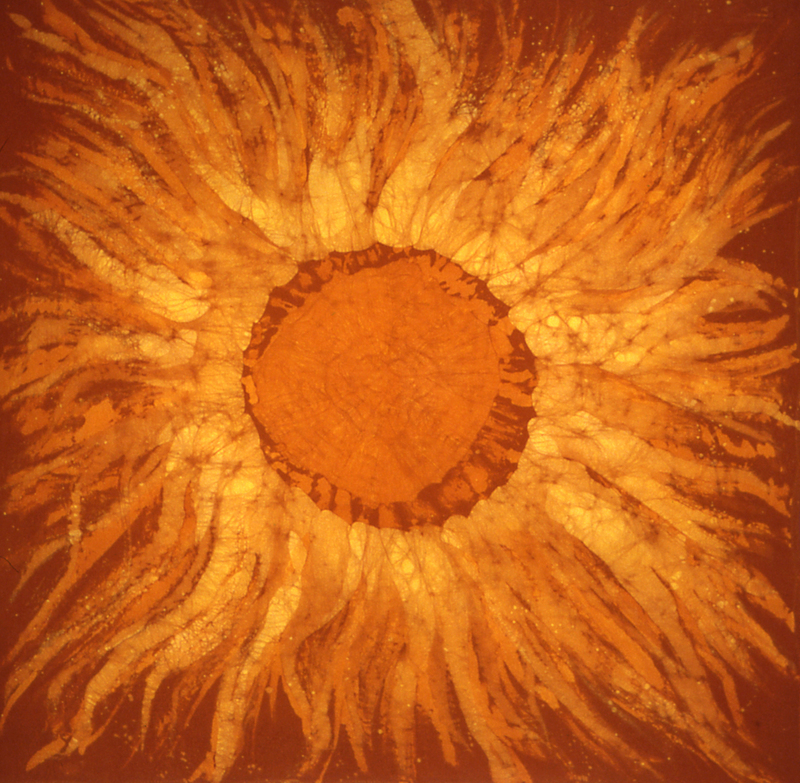 Since you can’t “see” what you are painting with batik (painting with clear wax and then putting it all into a dye bath), you have to just let go and flow with the process. But I loved taking things out of the dye to see how the colors had taken and mixed and where the cracks were. And I loved getting pieces back from the dry cleaners (who take the wax out) at the end. That was really the first time I saw how the finished piece looked. With fabric collage, I also like the design part. 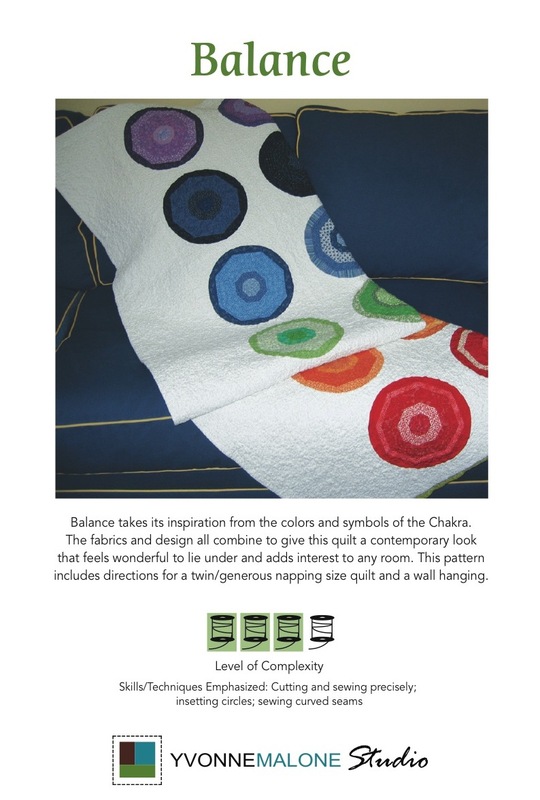 I belong to a quilters’ guild and they sent out a survey last year asking people why they quilt. One of the answers you could select was “It’s a good excuse to buy fabric.” I think that’s one of my favorite things about a new project – going to my favorite fabric store (New Pieces in Berkeley) and picking out just the right fabrics (colors, designs, etc.) for the project. I can spend hours laying out the fabrics side by side to make sure they will go together well. And I always leave feeling exhilarated and eager to start the project. I also like cutting pieces and making them all go together. The meditative part for me comes when I sew everything together. With fabric collage, I make the “picture” with pieces of fabric (sometimes I iron them down with Heat Bond and sometimes I put them under netting or Solvy) and then free-motion quilt over the top of the pieces. That quilting process is meditative for me. I am not an exact person. My designs are nature-oriented. So, I follow the curvy lines of water or trees with my sewing machine, making loops and designs while trying to make sure everything is adequately tacked down. The only part I really dislike is finishing the edges and putting on hanging sleeves. Now things have to hang straight or fit into a frame. Not my cup of tea. YM: Can you share with us what you are working on right now? Joy: Last summer I took a class called “If You Can Draw It, You Can Piece It.” I thought I “should” learn to piece instead of just doing fabric collage. The instructor helped me simplify my drawing and then create a piecing pattern. I love my design and picked out fabulous fabric. But I discovered that piecing is not really my thing. I think my piece turned out really beautiful, but it was a struggle all the way. I tore out lots of seams and ended up revising my pattern several times. At one point I was so frustrated that I put it away for a couple months. When I got it back out, I decided it didn’t have to be perfect and I just finished it (7 months later). I’m not sure if I will do that kind of piecing again, but I’m glad I tried it. 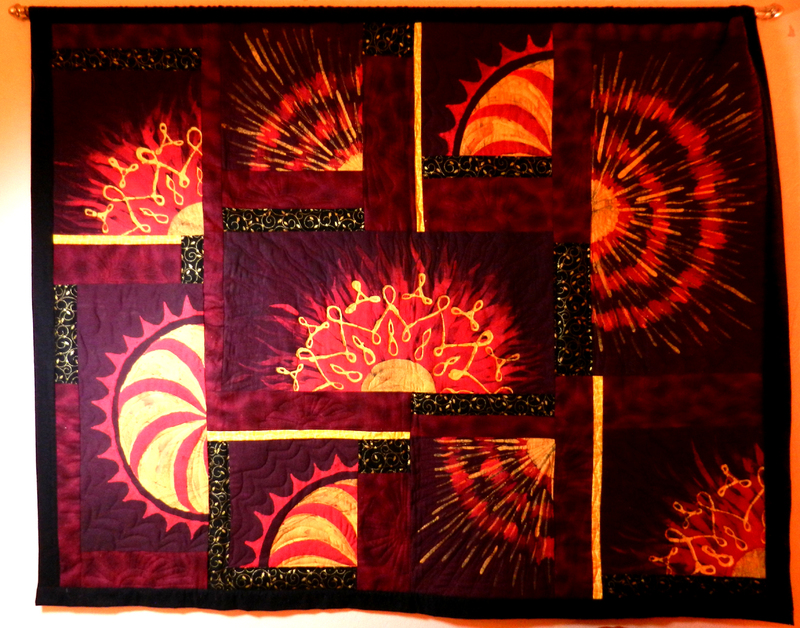 This one (Suns Hanging pictured below) was three pieces that got merged into a single quilt wall hanging. I have ideas for a couple others to work on next. YM: How did you learn to batik? Several years after I first started, I took a class from Betsy Sterling on wax resist/dye painting (roketsu zome) that honed my waxing skills a lot. Morning Sun below is a piece I did in that class. I took a community education class on color theory and did all the exercises with dye instead of paint. That was really a help in figuring out dyes to use. So, it was a combination of self-taught and classes. 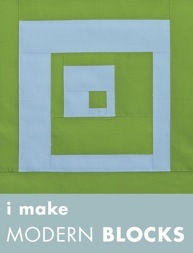 YM: I love the American Craft Magazine series “Why I Make,” so why do you make? Joy: I think it is really fun to start with next to nothing and end up with something beautiful. It makes my heart beat faster and gives me energy. I tend to dress in very neutral tones, but I do art with very bright colors. So, I get to buy fabric that I would never wear! And I do like it when someone tells me how much they like my artwork. I don’t have children, and I imagine my creations are my babies; sending a little bit of me out into the world. I think of my artwork as my contribution to making the world a little bit more beautiful. YM: What is your favorite quote? Joy: Gosh, there are lots of good ones. But one of my favorites is from Star Trek, the Next Generation. “Q,” the omniscient irritating character who puts Captain Picard on trial for crimes against humanity, says this at the very end of the series: “The trial never ends. We wanted to see if you had the ability to expand your mind and your horizons. And for one brief moment, you did. For that fraction of a second you were open to options you had never considered. That is the exploration that awaits you. Not mapping stars and studying nebulae but charting the unknown possibilities of existence.” Very inspiring! YM: What is your favorite art/craft book? Joy: The one I’m looking at currently. 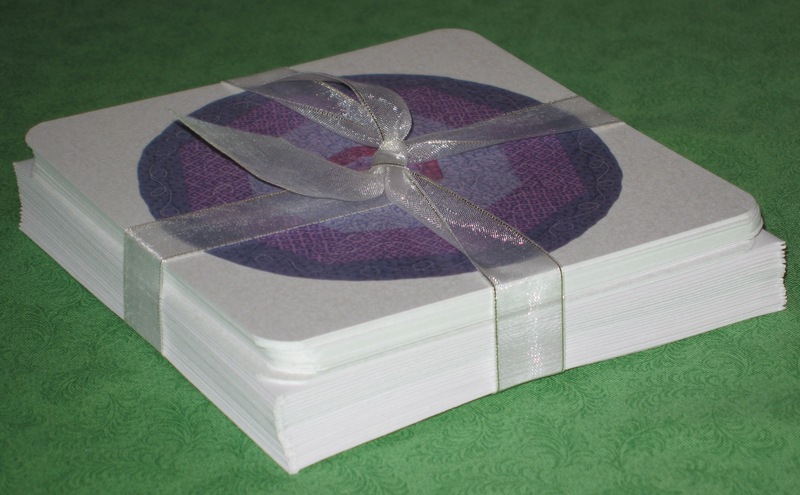 So, today it is Ruth McDowell’s “Piecing: Expanding the Basics” because it is has so many cool designs and color ideas in it. Joy: I love the music I listened to in college (Beatles, James Taylor, Paul Simon, Three Dog Night), but I also like some current artists (Adele and Lady Gaga), some crossover country (Dixie Chicks, Carrie Underwood), some folky types (Cheryl Wheeler and Peter Mayer) and Bonnie Raitt and Aimee Mann and the soundtrack to Mama Mia. I like music I can move to and sing-along with. I don’t usually listen to classical music, but once in a while I put on the music from my husband’s Orthodox church choir which is wonderful. I guess I’m all over the place. YM: What are your favorite art supply and fabric stores in the San Francisco area? Joy: I love New Pieces fabric store in Berkeley. They carry only quilting fabric, but it is all amazing! Their staff are all incredibly helpful and patient. They teach great classes at reasonable prices. It is a pick-me-up just to go in there. YM: What do you do to get inspired? Joy: Having coffee or lunch with a friend is the best. They want to know what I’m working on or they tell me what they are working on (art or writing) or they share a website they like. And I go away with new ideas. 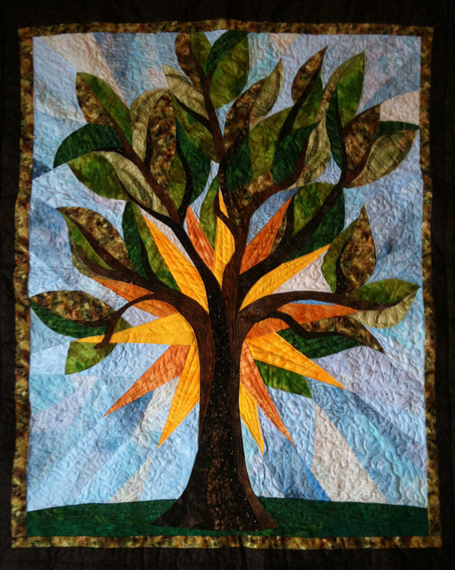 The East Bay Heritage Quilters (EBHQ) group has wonderful speakers that also inspire me. And I love to go bicycling in Marin with my husband, Michael. The beauty around me always makes me want to try to capture the images or colors in fabric. I curate a rotating volunteer art exhibit at a nearby hospital. We have about 30 artists who participate and their work inspires me as well. YM: Is there another art form you would like to explore next? Joy: I just heard Laura Fogg speak at the EBHQ meeting in January. She has taken fabric collage to a new level that really inspired me. So, I’m looking forward to exploring her techniques. I have to admit that I’ve always been intrigued by sculpture, not chiseling stone, but creating 3-dimensional pieces from a variety of materials. But while I’m still in a small apartment, I think I’ll stick with the fabric collage. Besides, I still have a lot of fabric to use up! To see more of Joy’s stunning work, visit her website.